Named by BRW Magazine as one of the top 100 Web 2 Applications, FACTS online is a powerful and easy-to-use system. This award winning system which we now have available to you on our website brings together budgeting, superannuation, tax and annual cashflow calculations into one single location. 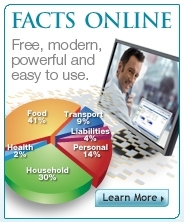 FACTS online even allows you to determine or review your attitude to Risk and Insurance. If you need to develop detailed family budgets, work out how much you will need to live comfortably in retirement, estimate your tax liabilities based on your family, income, superannuation and assets. You can even calculate Medicare levy surcharges. The cashflow component allows you to bring together all your previously entered financial particulars into one convenient location. This service is compliant with the National Privacy Principles Act 1988 and reflects current Superannuation, Taxation and Centrelink legislation. Click ‘Register’ and you’re on your way.